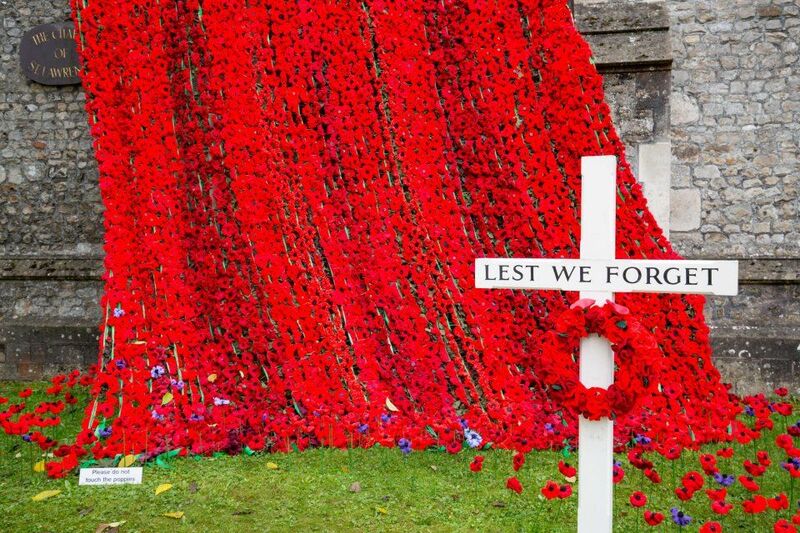 For those people who have been knitting poppies as part of the nationwide project to mark 100 years since the end of World War I, we will have our final session for collecting the poppies into a display on Monday 29th October from 6.30 pm until 8.30 pm in the Stables. We already have several hundred poppies. The poppies will be on display in Garvald and Morham Churches before and after Remembrance Day. 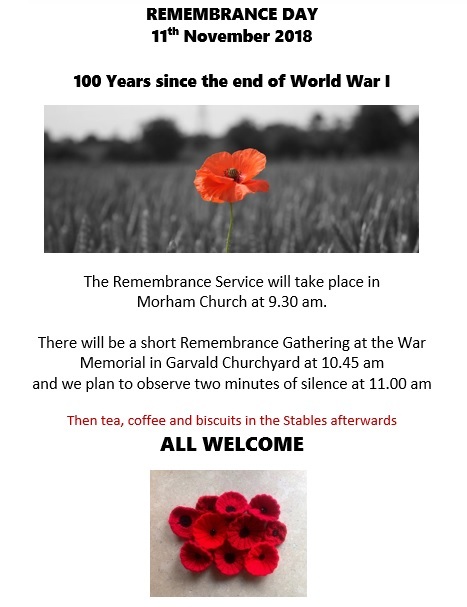 Arrangements for this especially significant Remembrance Day are on the attached poster. This entry was posted in Church, Events, History on October 25, 2018 by Admin. 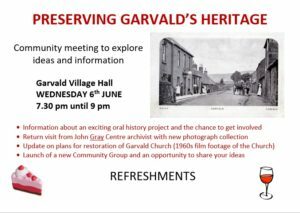 Garvald Heritage Evening – Great turnout! 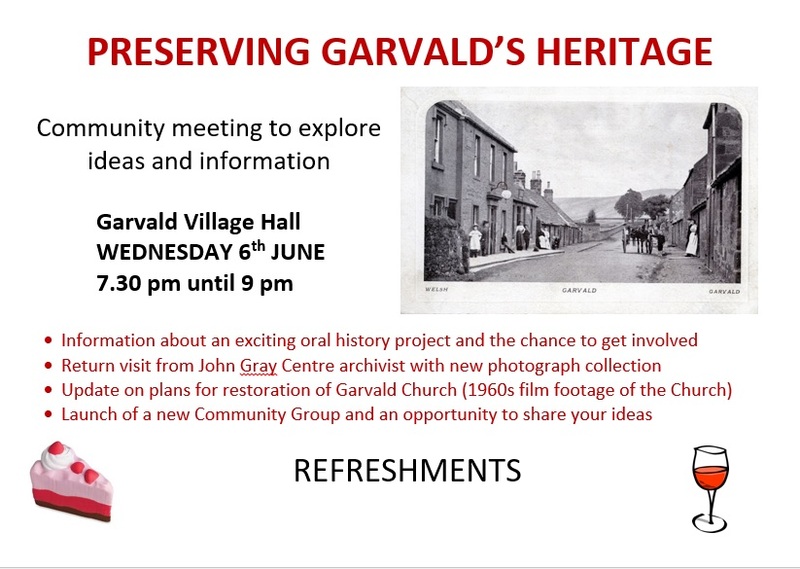 Thanks to everyone who came along earlier this month to hear and talk about the heritage that we have right here in Garvald. It was a great turnout – special thanks to those who helped out – especially on the tech front and for the delicious baking. For those who couldn’t make it, we’d like to take the opportunity to give a brief summary about the evening. 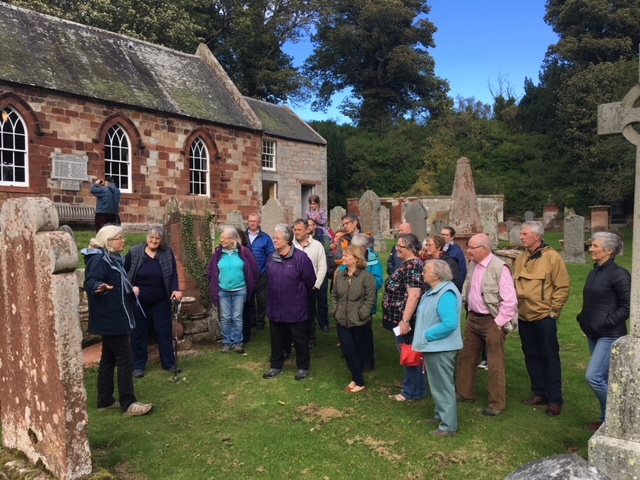 It came about because the church is in need of some repair work and a small group (Dave Neillans, Caroline McGregor, Stephanie Leith, Phillip White, Jo Robertson) has been looking at the scope of repair work and funding options. Funders generally like to see community benefit so we are interested to hear about any ideas for increasing use of the church, alongside the regular worship. At the meeting we presented the idea of the church accommodating a small exhibition about the history of the village. 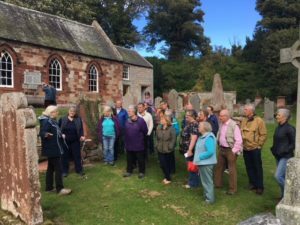 We had become aware of a project involving recording people’s memories of East Lothian, which is being run by Edinburgh University. Recordings gathered in this way could form part of the exhibition, so we went ahead with a pilot interview. We are grateful to Hamish Gibson for agreeing to be our first interviewee – we were able to hear clips from this interview at the meeting. It was great that a number of you expressed interest in this aspect of the project – a great way to capture the many stories about Garvald in living memory. We also asked everyone who came along to share ideas about use of the church – these included concerts (of various musical genres), information on the graveyard, walks starting and ending at the church, a community exhibition space, weddings, amateur dramatics. This entry was posted in Church, History on June 29, 2018 by Admin. This entry was posted in Church, Events, History on May 26, 2018 by GHS admin. 2018 marks the centenary of the end of WW1 and there will be a very special Remembrance Day in November. Many communities throughout the country are responding with a project to decorate their War Memorials, graveyards and Churches with knitted poppies. We would like to do the same in Garvald and we are calling on all knitters, crochet-meisters, and crafts-people to help produce a large number of poppies. Janet Winter at 5 Burnside Court has a ball of red wool and a small amount of black for the excellent price of £1.50 and she will oversee the collection of the poppies. A knitting pattern is attached here. Crochet patterns can be found by searching on-line. Time to dust off those knitting needles and crochet hooks and rediscover a forgotten skill. Watch this space for news of a knitting bee in The Stables later in the year! This entry was posted in Announcements, Church, History on May 14, 2018 by Admin. Following the successful local history night last summer, organised by the John Grey Centre Archives Department, local resident Tim Flinn suggested that Irene Anderson‘s book ‘Garvald, the history of an East Lothian Parish‘ could be digitised for archiving purposes and perhaps reformatted to make it easier to read. Heidi Ingram agreed this was a great idea, as there are few surviving copies of the printed book and the text may be of interest to village residents who haven’t seen it before. Due to the tiny print in the original book not being great for word scanning software, she dictated the work into digital format and scanned in Irene’s illustrations. She used these to produce a revised and updated second edition, including recent local projects and information from the 2011 Census. This edition has been published in her memory, knowing that she would have been delighted that her extensive and important research lives on and has been archived for posterity. Her sister has been sent information about the project. It is formatted primarily for online reading (but has been set to A5 page size so that it could be printed with two pages per A4 sheet). It can be found on the History of Garvald page. This entry was posted in Announcements, History on March 24, 2017 by Admin. Received a message from Bill Anderson which may be of interest to you all… Hoping he’ll send on some more historical photos to go on the website Gallery. I have just found your web site and thought I would get in touch, our dad was John Anderson who was headmaster of the two teacher Garvald Primary through the 1950’s until the late 1960’s, when we moved to Rosewell. I was brought up in Garvald at the school house from 1953 until 1968 and it was a wonderful place to grow up in at that time of innocence. Sadly our dad passed away in September 2015 at the grand age of 96 and my twin brother may have some photos of Garvald school that may be of interest to you. This entry was posted in History on January 19, 2017 by Admin. Family history info for Roslyn Lang? My name is Roslyn Lang, my Grandmother was Mary Gray, her Parents were Robert & Margaret Gray and she lived in Garvald till approx. 1908. She travelled to Sydney, Aust. and later met and married Robert Scott Stewart, who was from Helensburgh, Scotland. They had one child, my father, who was also Robert Scott Stewart. If anyone has any information about Mary Gray I would appreciate it. I would like to know her family’s address in Garvald if that is possible. I intend to come back to Garvald again & would like to know where she lived. This entry was posted in History on July 22, 2016 by Admin.